Indie supergroup Jetstream Pony recently released their second record, the brilliant Self Destruct Reality 12” 5-track EP, and vinyl copies sold out in one week. Consisting of former and current members of Luxemburg Signal, The Wedding Present, Turbocat and Trembling Blue Stars, the male-female/Anglo-American four-piece are smashing it right now: both artistically and in terms of popularity. 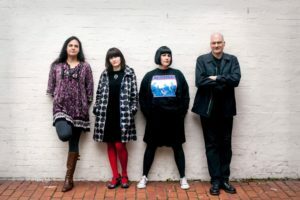 Fresh from playing The Wedding Present’s Edge of the Sea show, LTW caught up with three members of the band for a chat. Jetstream Pony consists of Shaun Charman on guitar, who was the original drummer of The Wedding Present, playing on their classic George Best and Tommy albums. Beth Arzy of Trembling Blue Stars, Luxemburg Signal and (former Sarah records artistes) Aberdeen fame is on vocals, Kerry Boettcher (formerly of Brighton’s late ‘90s John Peel darlings Turbocat) is on bass and occasional vocals, and Sara Boyle is on drums. Although this is essentially a new band, Shaun and Beth were previously in Fireworks together and Kerry and Shaun were both in Turbocat, so the musical chemistry and history run deep. Vinyl copies of the new EP are already gone, but if you like any of the above bands and are down with the classic melody-driven punk-pop indie style, you really should grab copy on CD before they all disappear too. LTW: John Peel championed bands you were previously in: Wedding Present, Turbocat and Aberdeen, to name but a few. Who would you say we have now to take over from his style of presenting, and do you get support from them? Beth: Gideon Coe has been a saviour and played a few of my bands: The Luxembourg Signal, The Fireworks and now Jetstream Pony. No one can ever fill Peel’s shoes but Gideon comes close as he champions new music on BBC6 Music and doesn’t stick to one genre. It’s weird to think we came close to losing 6Music as that’s where I hear new music these days! Shaun: Peel was one of a kind, and irreplaceable. Most of my music taste was based around listening to his show, but yeah: Gideon Coe is the nearest we have on 6 Music. His shows are always great, and he has a nice turn of phrase as well. Were you fans of each other’s music before you met? Beth: I liked The Wedding Present back in the day but kind of lost track of them. Saw them live recently and was reminded of how great they were. I loved The Popguns and The Fireworks and really joined them as a fan, because I didn’t want someone else to get the job when Emma went. Really great songs and fun to sing. I’d never heard of Turbocat but after Shaun played me Wanda and Zena I knew we had to play it live! Shaun: I saw and liked Trembling Blue Stars back in the day, though it was in a period when I was listening to less indie music. I listened to them recently and really liked them though, especially the song Helen Reddy. I love The Luxembourg Signal, and can’t understand why they are not huge! Blue Field may have been my favourite album of last year. What was it like revisiting the Turbocat song A Tribute To Wanda and Zena for the new EP, Kerry? Kerry: I was actually quite pleasantly surprised that the others wanted to revive Wanda and Zena. It was good to bring it back to life after so many years. Jetstream Pony actually have our own take on it. You can tell it’s the same song, but it sounds different to the original Turbocat version. It still has the erratic jaggedness of the original but there is also something slightly less angsty and more assured about it. It is actually a song about my sister in her crazy younger days, and she has passed away since I wrote it, so the song is actually quite poignant for me and it feels like it is keeping her memory alive. Are you still keeping busy with all of your other bands, Beth? Beth: The Luxembourg Signal are in California so I don’t see them often, but we do have a gig with The Ocean Blue Coming up and Trembling Blue Stars became Lightning in a Twilight Hour, which is a recording project with Bobby; no live gigs, so Jetstream Pony takes up the lion share of my time these days! Tell us about the Wedding Present gig, At the Edge of the at Brighton Concorde, Shaun. Also, how does it feel to see David Gedge’s current line-up of the Wedding Present playing classic album shows for Tommy and George Best, albums you played on? Shaun: David offered us the gig last year (thank you!) after our first single. The Fireworks also played a few years ago: it often involves bands with a link to The Wedding Present. It’s a very friendly event, like a Wedding Present convention almost, and we really enjoyed playing. I’ve actually seen George Best played by three entirely different versions of The Wedding Present, so I am quite used to it by now! It does feel weird, but I am also glad to have been involved with an album people still want to hear 30 years later. I wasn’t totally happy with the re-recorded release (how would you feel?! ), but understand how it happened. David told me at the time (10 years ago), though he wasn’t planning to release it back then. We do get on again these days, and go for the odd curry together. Also, David asked Kerry and I to play with him at the start of Cinerama. It didn’t work out, but we‘re on good terms these days. What led to Shaun and Beth joining Fireworks, and how did it lead to Jetstream Pony? Shaun: I was introduced to The Fireworks by my old friend Isabel, who played bass. Beth and I met when The Luxembourg Signal and The Fireworks played a couple of great gigs together. When co-singer Emma sadly decided that she was leaving, there was only one person we thought could replace her. Beth is based in the UK, so we thought she might be able to do both, and that led to the single. Meanwhile, I had started to write a few songs for The Fireworks, which Beth and I had demoed. When The Fireworks then went on hiatus, these songs became the new band, along with my friend and fellow Turbocat Kerry, and her friend Sara. That’s the rough version! Self Destruct Reality is still available on CD on Bandcamp.